A former Catholic high school in South Philadelphia was a tour stop for senior living professionals in town this week for a national convention on aging. Some 60 attendees of the LeadingAge Annual Meeting and Expo, the nation’s largest event for the not-for-profit aging services industry, visited St. John Neumann Places I and II on Oct. 29. Once the site of St. John Neumann Catholic High School, the location now features two affordable senior housing structures, with a combined total of over 125 units. The housing is offered through archdiocesan Catholic Housing and Community Services (CHCS), which has emerged as a leading provider of senior living throughout the Philadelphia region. Other CHCS residences include Norris Square Senior Housing (also known as Casa Carmen Aponte) in North Philadelphia, St. Francis Villa in the city’s Kensington section and Nativity B.V.M. Place, the former grade school of Nativity B.V.M. Parish in Port Richmond. In total, the CHCS facilities currently house over 260 low-income seniors, with rental fees scaled to accommodate residents’ resources. Funding for the structures is assembled from local, state and federal partners consisting of tax credits, community development grants, federal home loan banks and local financial institutions. 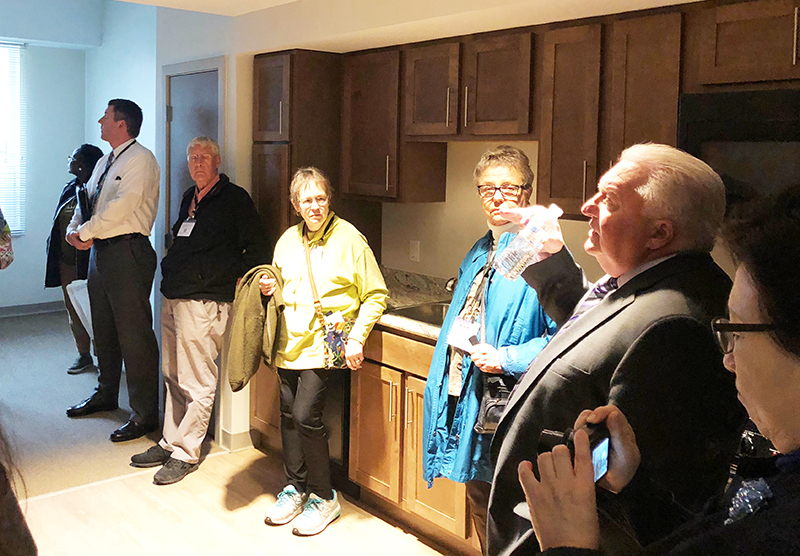 Such collaboration can help address a growing crisis in senior housing, said John Wagner, CHCS’s chief executive officer, who led the Oct. 29 tour. “As our colleagues learn about St. John Neumann Place I and II, we hope that they are inspired to begin or further their commitment to affordable senior housing in their communities,” Wagner said. The U.S. Department of Housing and Urban Development (HUD) projects that the nation’s population of adults aged 65 and older will double by 2050. To meet the needs of this growing demographic, CHCS has focused on developing a continuum of senior care that includes housing, senior centers, older adult care management, in-home support programs, adult day care and senior clubs, as well as an elder care helpline. Its range of offerings, which rely on blended funds from a number of public and private partnerships, have made the agency a kind of go-to among senior service professionals. Heather Huot, CHCS’s assistant director of parish and housing services, presented an overview of the agency’s partnership with a local healthcare system at the annual Catholic Charities USA gathering in September. Noting that the LeadingAge conference drew more than 4,500 professionals, Wagner said that CHCS’s senior housing embodies the church’s mission. “These developments are a strong representation of the church’s response to the needs of the community, and the repurposing of church treasure in meeting those needs,” he said.